Around 4:45 last night I decided that I should probably figure out what I wanted to make for dinner, so I perused my Pinterest food board. I’ve been wanting to make the chicken alfredo lasagna roll-ups, but last night I didn’t want to wait for chicken to thaw and then cook it. 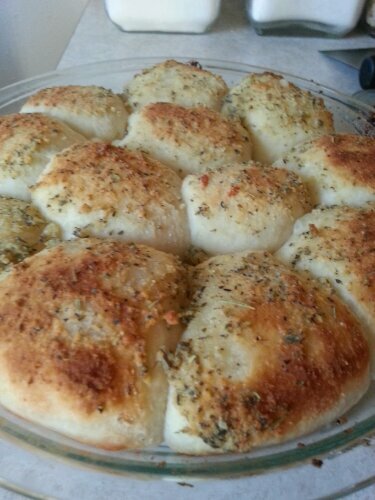 We did, however, have a roll of pizza dough in the fridge, as well as everything else you need to make za, so I decided to make these Stuffed Pizza Rolls. 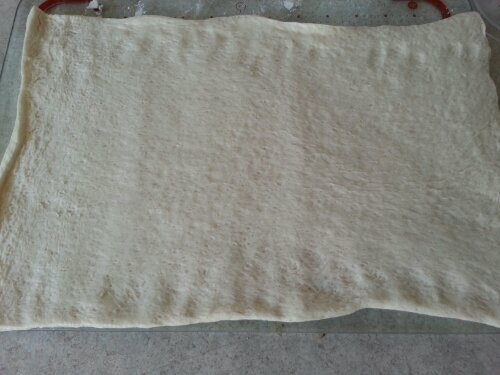 I rolled out the dough, but didn’t stretch it or anything (maybe this is 12″x8″ to begin with?). 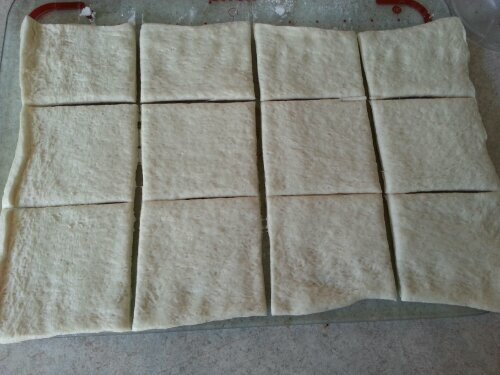 This recipe says to cut it into 24 squares, I only cut it into 12 because I thought 24 wouldn’t be big enough. Also, you want lots o room for stuffing it. Then start loading on the toppings. We only had pineapple and cheese, but you could do any pizza toppings. If you live by a Kroger, I highly recommend the Kroger brand pizza cheese. 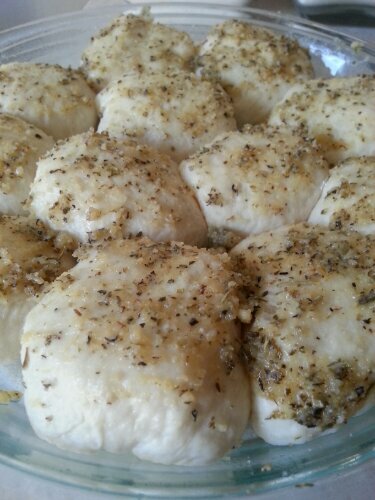 It’s a blend of four or five cheeses and it melts fabulously and tastes great. Then roll each of them up into a ball. I found it easiest to pull the corners into the middle and then pinch the seams together. 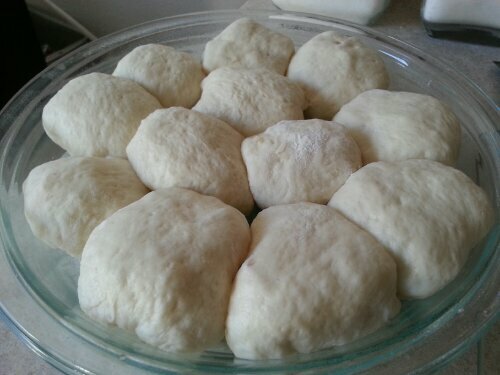 Lightly grease a pie plate or other baking dish and arrange the rolled-up bites in it. 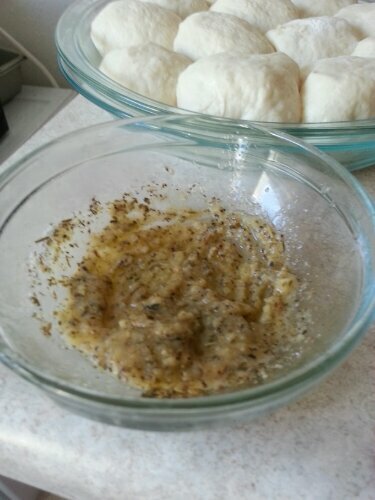 Then mix a 1/2 tablespoon of garlic powder and a 1/2 tablespoon of Italian seasoning into a tablespoon of melted butter and brush it onto the rolls. 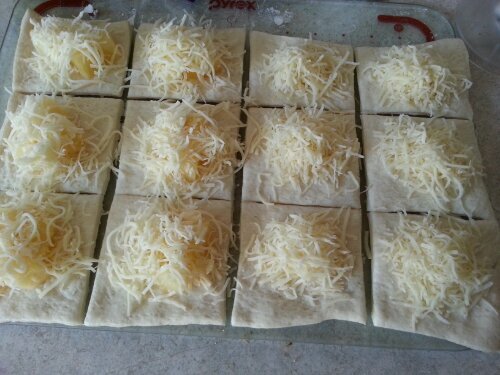 From there you’ll sprinkle 3 tablespoons of grated parmesan cheese on top. Of course I can’t make anything by following the directions and mixed the parm into the butter mix. It just thickened it up a bit, but tasted fine. Then put the plate into a 425 degree oven and bake them for 15-18 minutes. I also served mozzarella sticks with these (totally unnecessary). 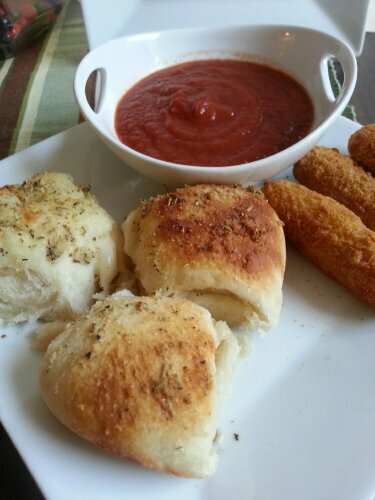 Warm up some pizza sauce and you’re ready to eat! I love how fast and easy this was. I think it’s meant to be more of an appetizer than a full meal, but we didn’t even finish all of them. I’ve actually been thinking about them all of today and I’m sure we’ll make them again sometime soon. 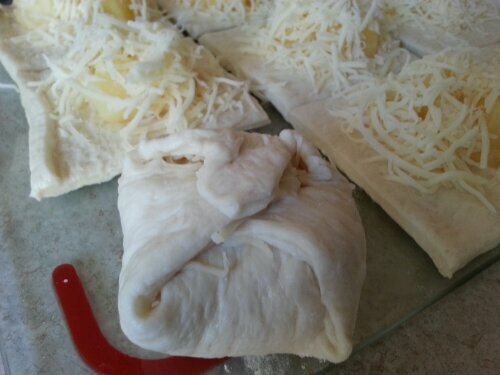 This entry was posted in Dinner, Food, Recipes and tagged cheese, pizza, pizza bites, pizza sauce, za. Bookmark the permalink.